Kidney transplant recipients are at high risk for cardiovascular disease (CVD) when compared with the general population, and CVD remains the most common cause of death in this population. This risk is high in both diabetic and non-diabetic kidney transplant patients. In addition to the traditional and nontraditional CVD risk factors, immunosuppressive medications contribute to this risk, partly through causing dyslipidemia and hypertension. At this point there is not enough compelling evidence to prescribe cardio-protective medications in the kidney transplant population. Primary and secondary measures to prevent cardiovascular events are underutilized in transplant recipients, largely from complications such as hyperkalemia or anemia with the use ACE inhibitors, but most importantly because the evidence to support their use is weak. 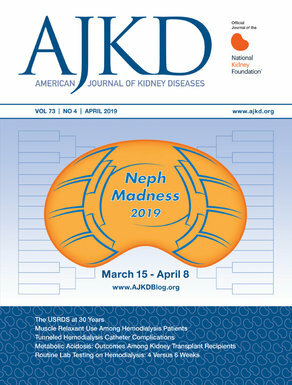 In a recent article in AJKD, Dad et al report the association between aspirin use and combined outcomes in kidney transplant recipients. They report a post-hoc analyses of the FAVORIT trial, a negative study that examined if lowering homocysteine with vitamin B could reduce cardiovascular disease in kidney transplant recipients. 981 aspirin users were matched to 981 nonusers using a propensity score and followed for 4 years. Adjusted models showed no significant difference among aspirin users in their risk for CVD events, all cause mortality, kidney failure, or composite outcomes. Although not a randomized trial, the propensity score matching limits bias and confounding. It is unclear if there is enough evidence to perform a randomized control trial examining if aspirin can reduce CVD. This study however does not report bleeding tendencies with aspirin, and would not support the use of aspirin for CVD or kidney outcomes reduction. It would appear that randomized controlled trials would need to target multiple rather than single interventions to identify potential benefits against CVD and other outcomes in this population.